Christian Kroll knew he wanted to do something good for the world when he finished university, he just didn’t quite know what. After traveling the world, witnessing pain points and problems in many different places, he came up with the idea for Ecosia. How could he make an impact in all of these very different places? The answer: by planting trees. In an increasingly moral and technologically advanced society, he had great timing: 70% of millennials said they were more likely to pay extra for a product that contributes to a cause they care about, so when Ecosia launched in 2009, it was extremely well received. Ecosia is a search engine that generates revenue from ads, like any other search engine. However, they use 80% of this profit to fund tree planting projects around the world. A certified B Corporation, Ecosia has had impact all over the world, working with organizations like the World Wildlife Fund and the The Nature Conservancy. Why trees? Trees and humans have a long history together. Trees, like humans, are the among the most complex of organisms. Living up to 5,000 years old, they have profound impact on the surrounding landscape, shaping the ecosystems around them in intricate ways. Trees can be sources of food, can provide habitats for endangered animal species, can sequester immense amounts of carbon dioxide out of the air, and contribute to biodiversity and ecological health. They bring life back into the soil around them, due to mutualistic partnerships between tree roots and mycorrhizal fungi. And this in turn can stimulate other plant life and animal resources. Trees are important for regulating water: they can act as buffers against flooding, but can also fight against desertification. Trees also are important in creating good air quality. Ecosia estimates that every search on their web browser sequesters about 1 kg, or 2.2 pounds, of carbon from our atmosphere. Ecosia works with local communities in order to determine what these communities need. The diverse effect of trees on their environments can almost always be a part of the solution, but more than that, Ecosia empowers local communities and stimulates local economic growth by getting passionate community members involved. While oftentimes working with big third party partners on the ground, such as the Eden Reforestation Projects or the Jane Goodall Institute, Ecosia also works directly with small communities, sometimes one or two community members, who have a vision of restoring environmental health to their regions. By working directly with community members, Ecosia generates local jobs, stimulates passion, and increases local economic growth. This is evident in the San Martin region of Peru, which was largely deforested in the 1980s as it became a red zone for cocaine production. Ecosia’s partners on the ground, PUR Projet, is working with community members, teaching them about forest management and sustainable harvesting, and providing local jobs planting trees. They are now growing cocoa instead of coca. Jacey Bingler, Ecosia’s head of PR and Country Director USA, joined the team in 2015. After completing a degree in journalism she had worked in communications and publishing, but felt that her work was unfulfilling and had no greater impact on the world. When she joined Ecosia, she immediately felt motivated and supported by the people and mission surrounding her. Businesses with social missions are often more successful because the people behind them are passionate about what they do and believe in the mission. This is certainly true of Ecosia, as Jacey says, it is very uplifting and has a positive impact on her work to be around such “enthusiastic people.” She says that this kind of work environment can make it harder when something does not work out the way you wanted, because you believe in the mission so much, but it also provides a community of people that support you when things don’t work out. Ecosia has planted over 25 million trees already and has over 70 million users. They aim to plant 1 billion trees by the year 2020. 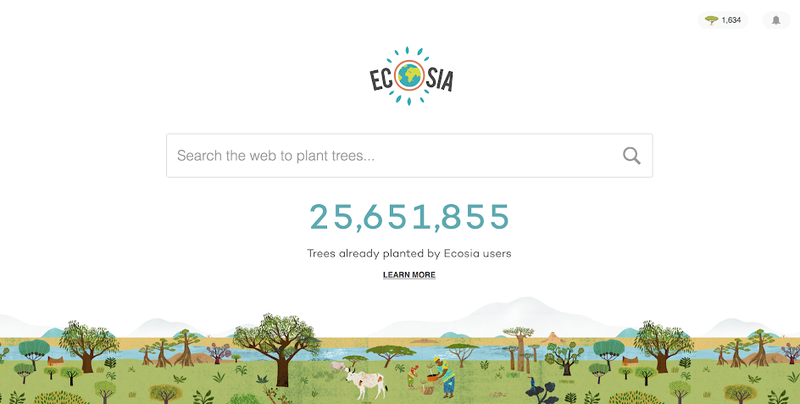 Partnering with Bing and using the money generated from ads to plant trees, Ecosia has an extremely scalable business model, with the success of having planted 25 million trees already, and the bright future of developing an even larger user base and generating more revenue to plant trees. Currently their user base is widely European, Australasian, and South American, with only 10% of their users coming from the USA. They are hesitant, however, to spend money on ad campaigns when it could be spent planting more trees. This is territory that they are navigating thoughtfully, doing cost-benefit analyses in order to determine if their ad campaigns will generate more money than they cost, or at least break even. Another core value of Ecosia is transparency. They publish monthly business reports and tree planting receipts and updates on ongoing projects, generating stories from their sites on the ground. In Ethiopia they are making a difference on the ground, directly interacting with and influencing communities. In February, 2018, they generated 793,636 Euros, 52% of which they invested in tree planting. Minus operating costs, this equals 80% of their surplus. They funded tree planting projects in Indonesia, Tanzania, and Madagascar. In the future, Ecosia wants to create an option for sustainable searches. Because search engines influence behavior so much, this leverage point could be used in order to drive more sustainable behavior. When you search something on any search engine, the likelihood that you end up clicking, buying, or doing the first option is 42%. The likelihood of clicking the second option is only 12%. This power of convenience could be harnessed so that the next time you are looking to buy a washing machine, instead of the first result popping up being a new, unsustainably made washing machine from Lowe’s, the first result could be an innovative, sustainable version of the washing machine from a new startup, or a used washing machine that someone in your area is selling. By making sustainable options accessible and easy, this idea has huge potential for changing the way that users think and behave, but most importantly, consume. While this idea is in its earliest stages, the world needs a sustainable search engine function, especially when other search engines, like Google, refuse to work with any charitable versions. Ecosia originally partnered with Google, however, Google backed out of their agreement a few weeks after launching due to the fear that a search engine with a charitable cause would generate false clicks on ads. In order to protect their clients, Google drew out and drafted a statement in their bylaws saying that they would not partner with charitable search engines in the future. In Ecosia’s nine years of experience, there has been no data to support this assumption, according to Bingler. When you go outside, be mindful of the trees around you and take the time to appreciate all the work that they do for your local ecosystem. And next time that you go online, remember to install Ecosia as your default browser; you can be a part of an important mission to improve lives and environments everywhere by planting trees.